Karl Jenkins "The Armed Man"
Hubert Parry "Blest Pair of Sirens"
Ralph Vaughan Williams "English Folksong Suite"
Edward Elgar "The Music Makers"
Arthur Sullivan "Overture - Yeoman of the Guard"
Robin Wells "A Festive Te Deum"
Arthur Sullivan "Pineapple Poll Suite"
Carols, readings and highlights from Handel's "The Messiah"
Carols, readings and “The Trumpet Shall Sound” from Handel's "The Messiah"
SINCE 1904 The Dream of Gerontius by Edward Elgar has been a popular choral work with large choral societies. This was the choice of the Farnham and Bourne Choral Society for their Spring Concert on Saturday May 11, in the Great Hall of the Maltings. Chorally committed to this work the choir enjoyed immersing themselves in both the poetry and music of this grand piece giving an honest performance using their experienced musicianship to best effect. The chamber choir was alert and competent giving a fresh clear tone in their commentary role and the final climax of the main choir "Praise to he Holiest" was an uplifting moment. The soloists for the evening were James Atherton, tenor, with Susan Mackenzie-Park, contralto, who communicated with understanding and poignancy. Hugh Hetherington, bass, commanded attention in a limited role. Robin Wells guided his familiar forces through this grand work with clear confident direction and a sympathetic understanding of the deep spirituality of this music. Under his guidance the large orchestra strove to give a balanced accompaniment. Phrasing and tone colour contributed to the intensity and passionate declaration for both soloists and choir demanded by Cardinal Newman's poetry and Elgar's music. The whole ensemble is to be congratulated on its dedication to realise this formidable work. The next Farnham and Bourne concert will be Mozart Requiem and Eine Kleine Nacht Musik on Saturday, November 9, at St Thomas-on-the Bourne. 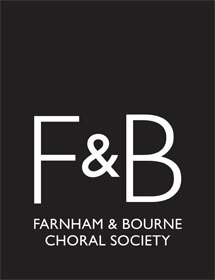 Ninety seven members of the Farnham & Bourne Choral Society sang in its Remembrance concert on Saturday 9th November at St. Thomas-in-the Bourne. The church had a capacity audience of 250, ranging in age from the single to the nearly triple figures. Judging by audience comments, the varied first half programme was a particular hit. It opened with Handel’s rousing chorus Zadok the Priest, followed by Mozart’s Eine kleine Nachtmusik, sensitively conducted by Robin Wells, and played by the 22-piece orchestra led by Sally Dewey. Mendelssohn’s short Prayer for Peace preceded another choral work by Handel. This was an arrangement of Eternal Source of Light Divine, from the Ode for the Birthday of Queen Anne, for solo soprano (beautifully sung by the pure voice of Jenny Sanders) and solo trumpet (played from the organ loft by Will Spencer). Due to its popularity, this item had been included for a second consecutive year. For the Fallen, a poem set to music by Mark Blatchly for the Royal British Legion Festival of Remembrance in 1980, was then sung by the choir, perhaps a little muddily (how appropriate!) and immediately followed by the trumpeter’s perfect sounding of The Last Post from within the vestry. At this point there was many a moist eye. Post interval, Mozart’s Requiem completed the concert. The soloists, Ruth Parr (soprano), Alex Lawrence (contralto), Hugh Hetherington (tenor) and Simon Cakebread (bass) were all proficient in their parts. While it must be said the choir had a wobbly moment or two in the more challenging passages, none was too obvious, and there was great applause at the end of the work. I, along with the audience, had a very enjoyable evening. There was a pleasant relaxed atmosphere - the big choir looked good - the red scarves adding to the festive spirit - and Jubilate Brass were a wonderful bonus. The Choir produced a rich well balanced sound which was such a pleasure to listen to. It was a very interesting programme with some old favourites and some new - Adeste Fideles and Long Time Ago being particularly memorable. The mood changed with "Our Father's heart begotten" with its rather sombre words and six verses. However, it was great fun singing "While Shepherds Watched....." to "Ilkley" - we all enjoyed singing along with that! The warm receptive audience completed the festive atmosphere, and as I watched people leaving the Church, they mostly had huge smiles on their faces having had a lovely evening listening to evocative Christmas music.